The steps needed to unlock Luna's Howl in Destiny 2: Forsaken, and the 1:4 scale replica weapon via Bungie Rewards. In Destiny 2: Forsaken, one of the most coveted weapons players want to know how to get is the Luna’s Howl Hand Cannon. To get Luna’s Howl in Destiny 2, players will need to complete a series of tasks in order to prove themselves worthy to Lord Shaxx. Along with unlocking Luna’s Howl in Destiny 2, a 1:4 scale replica becomes available for purchase via Bungie Rewards. Of course, you can’t access either of these versions of Luna’s Howl without completing the in-game requirements. To help, we put together a quick guide on how to get Luna’s Howl in Destiny 2: Forsaken! By unlocking Luna's Howl in Destiny 2: Forsaken, players will also be given the opportunity to purchase a 1:4 scale replica from Bungie Rewards. In Destiny 2: Forsaken, you’ll need to complete a series of tasks assigned by Lord Shaxx in order to get Luna’s Howl. To unlock these tasks, you’ll need to visit Shaxx in the Tower and unlock the “Shock and Denial” Pursuit to begin the process of earning Luna’s Howl. There are several steps needed to unlock Luna’s Howl in Destiny 2: Forsaken, all of which we’ve listed below. Finish 10 Competitive matches (loss still counts towards your progress). While most of these tasks are straightforward, it can be difficult to rank up to Fabled, with Destiny 2 players having felt this frustration last season while attempting to unlock Redrix’s Claymore. Additionally, it can be hard to earn Precision Kills in Destiny 2 using Hand Cannons, especially if you're not a regular Hand Cannon user. Our advice is to complete the easiest tasks, such as 3 Rumble matches and 10 Competitive matches, first before attempting some of the harder assignments. Once you’ve completed all of the requirements and have unlocked your Luna’s Howl in Destiny 2, you’ll also have the unique opportunity to purchase a replica through Bungie Rewards. 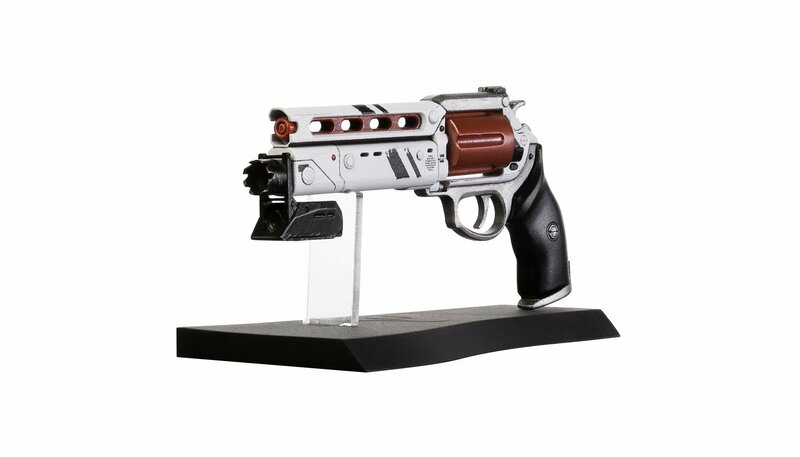 Whether or not you want to spend money on a 1:4 scale replica of Luna’s Howl is up to you. However, to unlock Luna’s Howl in Destiny 2: Forsaken, simply follow the task list assigned by Shaxx and return to him once it’s completed to receive your shiny new Hand Cannon. For more on Luna's Howl, be sure to check out a review of the Hand Cannon courtesy of YouTuber Drewskys Channel (seen below). For more on Destiny 2: Forsaken, be sure to check out some of our previous guides including where to find Wanted: Mazan, Lost Captain in Destiny 2: Forsaken, how to get the Ace of Spades in Destiny 2: Forsaken, and a list of all new Exotic weapons and armor in Destiny 2: Forsaken. By reading through this guide, you should now know how to get the Luna’s Howl Hand Cannon in Destiny 2: Forsaken.